When we were in Toronto, we rented an apartment in Queens West, a neighborhood Vogue rated second only to Tokyo as one of the coolest in the world. No lie there- it was teaming with interesting places to shop, eat, explore, and see, with wonderful art and music around every corner. 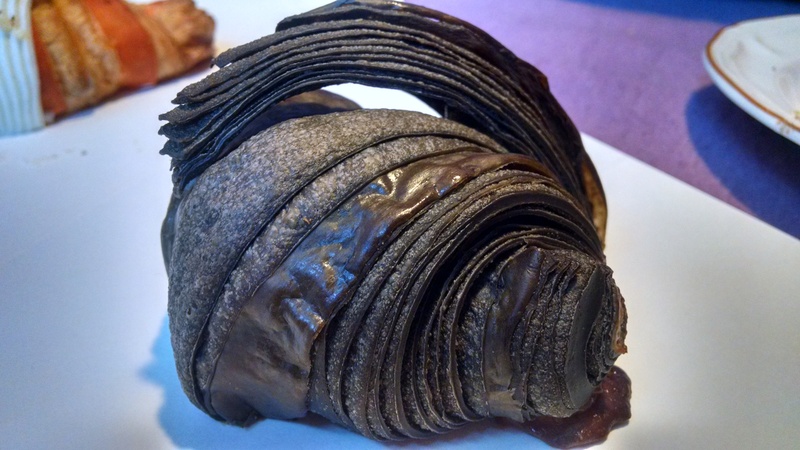 Not a block away was Nadège Patisserie, a bonafide slice of Paris in the middle of Canada. 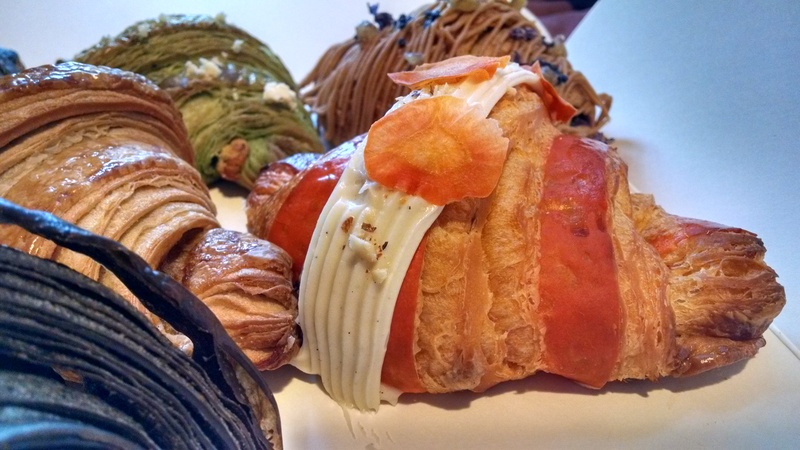 We were lucky enough to be there right before Croissunday, a yearly event with fifteen limited flavors of croissants, starting at 8am and ending when the bakeries run out. I waited in line for six flavors of their finest and after devouring them, we decided they were the best we’d had in or out of France. This year, the flavors were varied and erred toward the sweet side but branched out into savory flavors as well. We picked carrot cake, cassis and violet, goat cheese and arugula, Bellwoods Brewery beer, squid ink and yuzu, and black sesame. Some of the flavors were repeats from the previous year but since this was our first go-around at the event, we were pleasantly surprised by them all. 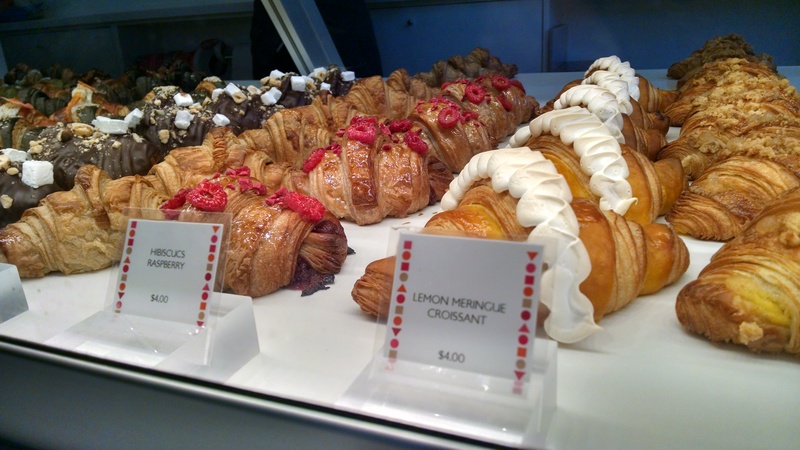 Nadège is modern and has a beautiful array of pastries with Canadian tweaks to the flavors and classic French construction. 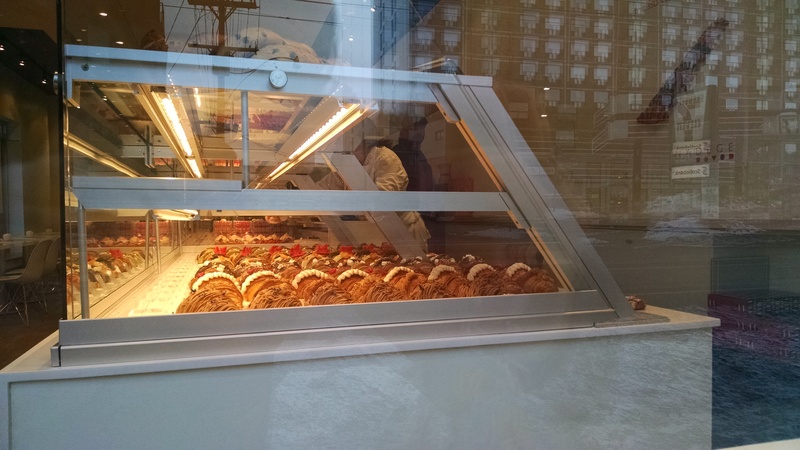 The storefront is minimal, all the better to showcase the incredibly intricate pastries inside the window, and it bustles from 8am to 8pm every day. Our croissants were fresh and warm. We started from savory to sweet, pausing for water and tea in between. We hedged our bets for favorite flavors, but were pleasantly surprised to find that we loved different ones than we initially expected. The Bellwoods Brewery beer-infused croissant, utilized in a beer jelly filling and in the pastry dough, was bittersweet and almost savory, with a beautiful yeastiness accentuated by the hops. The goat cheese and arugula was gently vegetal, with pockets of sweet, tangy cheese in the bubbles of air. As far as the sweeter flavors went, some of the flavors were muted– the black sesame was tasty, but showier than it was flavorful. The cassis and violet was beautiful on the outside, with a near-Mont Blanc appearance, but had very sparse amounts of filling on the inside. Carrot cake fared similarly. By and large, our favorite was the squid ink and yuzu. Understated in filling but bold in color, it had a beautiful, fresh citrus filling and pleasant balance of sweet and savory flavors. A very unique event and a wonderful way to experience the French side of Toronto.